Congress has less than 3 weeks to make a budget deal or risk entering yet another government shutdown. Reports have suggested that if no deal is reached, the President could try to bypass the budgetary standoff in Congress over his $5.7 billion demand for a border wall by declaring a national state of emergency to secure funds through other means. This is all for a militarized non-solution to the non-crisis of undocumented immigration, which is fundamentally a humanitarian matter—not one of border security. Meanwhile, the real crisis is increasingly staring us in the face. The Trump administration officially continues to reject climate science, but it’s possible to see a clear pattern behind militarizing borders and underfunding disaster relief: turning America into an armed lifeboat amid rising seas. As climate change accelerates, more vulnerable communities within American borders will be battered by increasingly unnatural disasters, and more people outside our borders will be displaced by increasingly unlivable conditions in their homelands, which means many more people will quite justifiably seek refuge elsewhere. Rich countries like the United States could invest however much it costs to transform to a zero-carbon economy, build resilient infrastructure for communities and secure a livable future for all. Or we could keep militarizing our budget, doling out tax cuts to the wealthiest few, and shrinking public resources to make more and more people expendable. Trump’s policies lean hard toward the latter. Surely enough, the past month’s government shutdown has given cover for agencies like the Interior Department to grant drilling permits to energy companies with even less scrutiny than usual. And it’s very revealing to see how the administration has proposed repurposing money for the border wall from other sources in the event of a national emergency declaration. The most likely seems to be dipping into military funds, which is at once an admittance that the Pentagon doesn’t need all the money they have sloshing around, and is yet another militarized solution to a humanitarian problem. Another proposal suggested repurposing the money from disaster funds for Puerto Rico, Florida, Texas, and California, which would be a cruel removal of aid from Americans still suffering the lack of adequate relief in the aftermath of disasters fueled by climate change—in order to actively harm migrants already fleeing dangerous conditions. This is all especially ghoulish, but America’s deeply militarized budget has been laying the groundwork for the “armed lifeboat” track of climate adaptation for decades now. The military portion of America’s annual discretionary budget is already crazy. 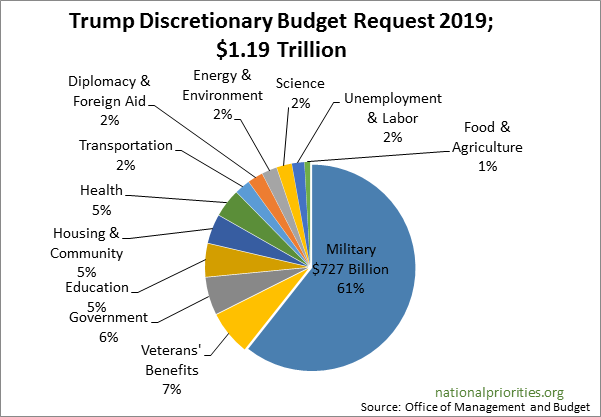 61% of President Trump's entire budget request in 2019 went to fund the Pentagon, against a measly 2% on energy & environment. Some in the national security community want to bump this up to $1 trillion within the next decade—even after the Pentagon’s first-ever audit revealed how unaccountable their budget already is. Climate advocates are organizing support for a “Green New Deal” to transform U.S. energy systems to 100% renewable energy over the next 10 years, with a federal job guarantee for all the work involved in shifting to a zero-carbon economy and avoiding the worst impacts of climate change, while a new crop of politicians in Congress like Rep. Alexandria Ocasio-Cortez are cleverly reshaping the usual arguments about how to pay for such an enormous project. 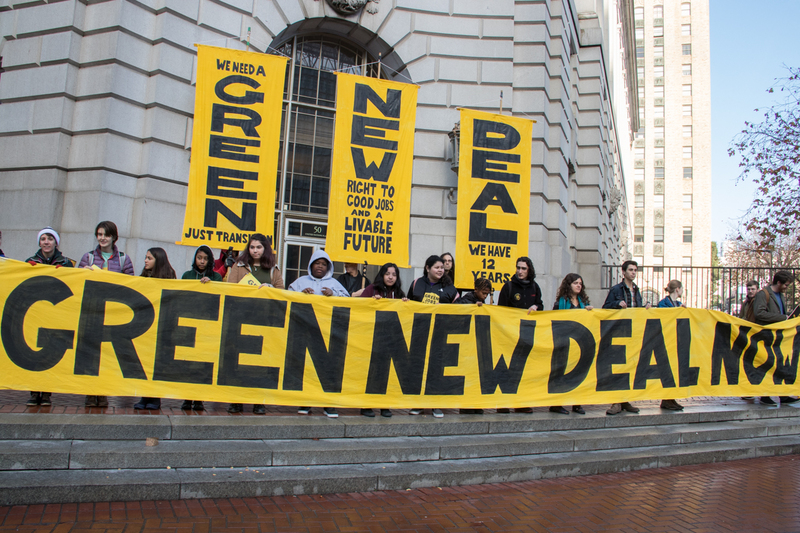 As political and ecological crises get more intense, a growing number of Americans seem primed to deeply reconsider national priorities and support a Green New Deal agenda. It’s worth using this as an opportunity to center our country’s enormous military budget—and not just because of all the massive, unaccountable bloat at the Pentagon. The U.S. military’s global presence is incredibly wasteful, and is itself thought to be the largest institutional consumer of oil in the world. And that's to say nothing of the reality that securing access to foreign oil resources and perpetuating the global fossil fuel economy has been a major motivator of U.S. wars. Imagine how much any portion of the current $700 billion in Pentagon spending could do if our government decided to fight climate change instead of waging endless war. What if we transferred just 10% of our current military budget—$64.7 billion in 2017—to fight an actual long-term existential threat? According to our Trade-Offs Tool, that would support a year’s worth of 873,449 clean energy jobs. To put that in perspective, nearly 3.2 million Americans already work in clean energy jobs, while only 53,900 workers are currently employed in the coal mining sector. And why stop there? By the end of FY2019, the vast budgetary costs of the post-9/11 wars in Iraq, Afghanistan, and Pakistan will add up to $4.93 trillion—an average of $274 billion spent per year for 18 years on devastating, destabilizing, and unwinnable wars. Americans are overdue for a fundamental reframing of our priorities. It’s well past time to start winding down our militarized budget and reinvesting in a sustainable future for everyone. Climate change is our biggest crisis, and a green future is one without war.